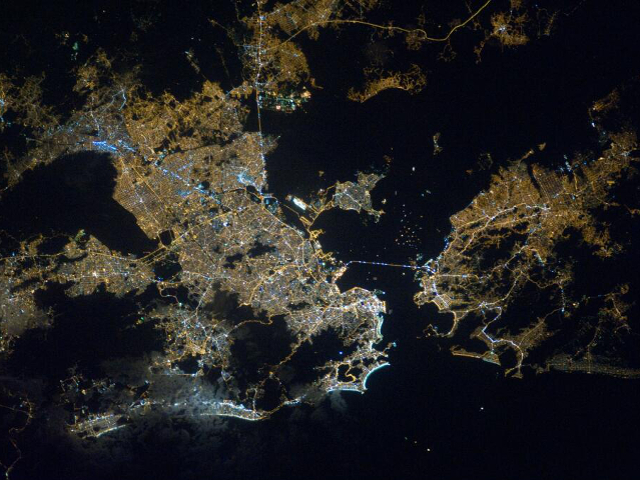 Downtown Rio de Janeiro shines at night in this photo tweeted from the International Space Station. Photo courtesy of @ESRIlabs. It’s no secret that big data has enormous potential to change the way we think about and interact with cities. Whether allowing users to capitalize on the marketability of open data, hitch a ride using their smartphone, or visualize a day in the life of a dynamic city, data applications and visualization are increasingly important tools for the urban citizen. That’s why Jack Dangermond – President of mapping giant ESRI – joined forces with TED founder Richard Saul Wurman and @radical.media to launch Urban Observatory, a “live museum with a data pulse” that allows users to make direct comparisons using interactive visualizations for 16 world cities. Since its launch at the ESRI user conference earlier this month, Urban Observatory has garnered a lot of attention for its innovative approach, sleek design, and thorough data resources. Simply put, Urban Observatory can do a lot, but what does it do best? With that in mind, we at TheCityFix put on our data-driven thinking caps and came up with this list of the three coolest things you can do with Urban Observatory. While good data is steadily becoming more accessible for cities in the developed world, accessing the same reliable, accurate, and regularly updated data for developing cities is a constant challenge. The challenges of collecting data on developing cities is multi-faceted: oftentimes governments and civil societies lack the capacity, the resources, or the infrastructure to collect reliable data as the city grows. Despite this, the team at Urban Observatory has managed pull together an impressive amount of information on developing cities Delhi, Johannesburg, Mumbai, and Rio de Janeiro. For instance, the following still-frame compares housing density in Mumbai and Delhi, both Indian cities but with very different settlement patterns. Urban Observatory allows you to make side-by-side comparisons of urban data. Photo by Urban Observatory. The Urban Observatory interface is organized by theme, allowing you to choose between map layers in the categories of work, movement, people, public, and systems. While some of the available layers – population density, for example – are nothing new for interactive mapping, the Urban Observatory teams takes this one step further by showcasing less common but equally interesting data on things like wind speed, urban footprint, and open space. By far the most unique layer of information is titled ‘From the ISS’. From here, users can enlarge photos on the map that were tweeted by astronauts from the International Space Station. Additional images were pulled from NASA satellites to complete the map layer. The results are breathtaking views of cities at night, swirling urban harbors, and sprawling metropolises, all taken from space. See, for example, the above photo of a bustling Rio de Janeiro at night. Not impressed so far? Perfect! Perhaps the most exciting feature of Urban Observatory is that the power to shape this tool and expand what it’s capable of is in the hands of the user. Governments, civil society, NGO’s, and individual citizens can contribute data through a simple online form managed by ESRI. Wurman himself acknowledged at the ESRI user conference that the goal is for Urban Observatory is to house data on over 100 cities. That won’t be possible, however, without more open data resources and contributions from across the world. Until then, we can enjoy this fascinating window into the world of 16 cities, and hope that more lies around the corner. To learn more about Urban Observatory and explore the comparison tool, visit https://www.urbanobservatory.org/compare/index.html.